Super cute Cupid boy! I haven't even given a single thought to Valentines Day yet. Uh oh. I do look forward to seeing your cookie pop!! I think it's a wonderful idea, since I am a big fan of cookies. It's my favorite sweet. Cupid is so cute! What a fun lunch for Valentines! :D Cookie baking sounds like fun! I will be doing that tomorrow if they fix my sad broken oven! @Emily Ng : Thanks a lot Emily! Preparing something to share with their classmates will be a challenge hehehe :D Hope you have fun preparing the food party! Cute Cupid boy.. Can't wait to see your cookie pops.. Happy baking. as usually.. u always amazed me. I love the way you did to the egg-sheet, they're so smooth.. I've made it too, check my blog http://bentosiayah.blogspot.com/2011/02/blossomed-flower-in-his-bento.html. but since I've failed with the sheet (they're bubbling, whereas I've strained the beaten-eggs like you said), i only made these flower shapes. You have mad bento skills!! LOL I love Cupid Boy he is so cute!!! aww..cute little Cupid, and looking forward for your cookie pops, I am sure it will be a success..
Aw, this cupid is so cute! I felt in love with him, hehe =) How has you made the skin? @Linsey : hahaha ... Thanks a lot Linsey! Cupid is adorable! Happy Valentine's Day Lia! You are so talented, I can't wait to see what kind of pops you make. Love the Cupid, very cute! Oh..at last I can see your baking soon Lia :) Did you get anything at Phoon Huat or BIY when you're at S'pore? I was out of internet connection in the morning (now that you mention the black out)... I would have LOVED to go to the baking supplies shop with you! 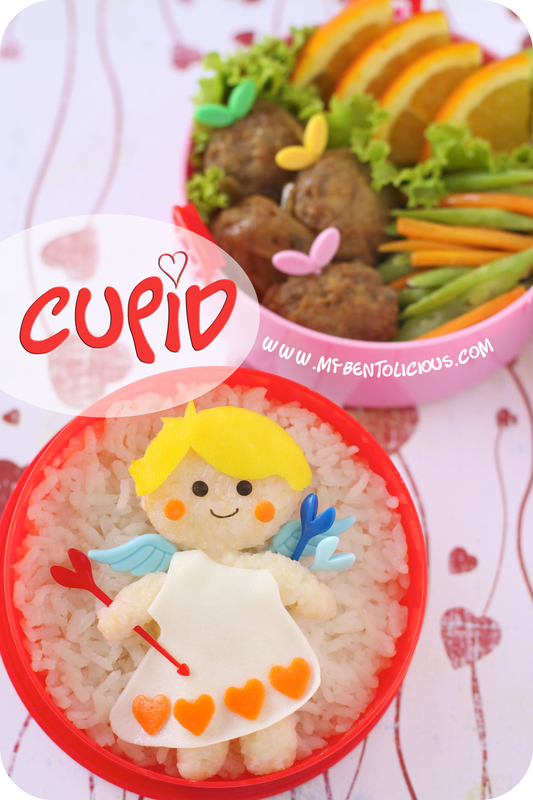 Oh my gosh Lia, your Cupid is so cute and sweet! :) Absolutely perfect for Valentines Day. So cute!! It looks like Cupid is all rested and ready to do some match-making. Semangat buat bikin cake pops-nya! @Sysyl : Thanks a lot Syl!